Cauliflower, B. oleracea. Old World cabbage relatives that are grown for succulent flower heads or buds. All need rich soil, abundant moisture, and cool weather (but avoid prolonged exposure to temps below 50 degrees). Cauliflower is harvested when the heads reach full size, but before the tiny buds (called the curd) begin to develop and open. 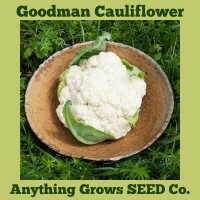 Cauliflower succeeds best where spring or autumn weather is uniformly cool. Some varieties are blanched (the large outer leaves drawn up and tied to shade the developing bud) to produce a milder flavored curd. Early, generous producer of well-rounded ivory heads. Goodman will surprise you with a slight frame that manages to produce very well-protected heads with deep curds and tender florets. 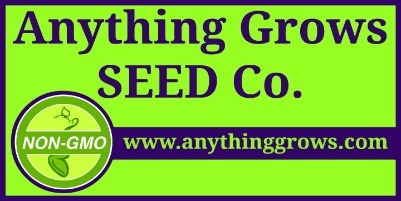 Good holding ability in the field with a short harvest window. Spring or fall crop. 5" heads. Maturity 70 Days. ..